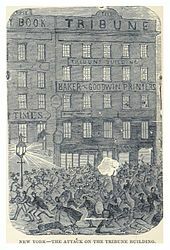 A drawing from a British newspaper showing armed rioters clashing with Union Army soldiers in New York City. 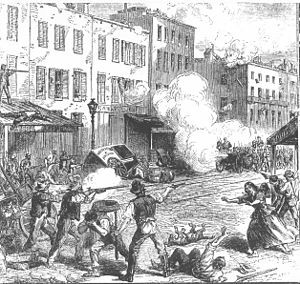 The New York City draft riots (July 13–16, 1863), known at the time as Draft Week, were violent disturbances in Lower Manhattan, widely regarded as the culmination of white working-class discontent with new laws passed by Congress that year to draft men to fight in the ongoing American Civil War. The riots remain the largest civil and racially-charged insurrection in American history. U.S. President Abraham Lincoln diverted several regiments of militia and volunteer troops after the Battle of Gettysburg to control the city. The rioters were overwhelmingly white working-class men, mostly Irish or of Irish descent, who feared free black people competing for work and resented that wealthier men, who could afford to pay a $300 (equivalent to $9,200 in 2017) commutation fee to hire a substitute, were spared from the draft. Initially intended to express anger at the draft, the protests turned into a race riot, with white rioters, predominantly Irish immigrants, attacking black people throughout the city. The official death toll was listed at either 119 or 120 individuals. Conditions in the city were such that Major General John E. Wool, commander of the Department of the East, said on July 16 that, "Martial law ought to be proclaimed, but I have not a sufficient force to enforce it." The military did not reach the city until the second day of rioting, by which time the mobs had ransacked or destroyed numerous public buildings, two Protestant churches, the homes of various abolitionists or sympathizers, many black homes, and the Colored Orphan Asylum at 44th Street and Fifth Avenue, which was burned to the ground. The area's demographics changed as a result of the riot. Many black residents left Manhattan permanently with many moving to Brooklyn. By 1865, the black population fell below 11,000 for the first time since 1820. The Democratic Party Tammany Hall political machine had been working to enroll immigrants as U.S. citizens so they could vote in local elections and had strongly recruited Irish, most of whom already spoke English. In March 1863, with the war continuing, Congress passed the Enrollment Act to establish a draft for the first time, as more troops were needed. In New York City and other locations, new citizens learned they were expected to register for the draft to fight for their new country. Black men were excluded from the draft as they were largely not considered citizens, and wealthier white men could pay for substitutes. New York political offices, including the mayor, were historically held by Democrats before the war, but the election of Abraham Lincoln as president had demonstrated the rise in Republican political power nationally. Newly-elected New York City Republican Mayor George Opdyke was mired in profiteering scandals in the months leading up to the riots. The Emancipation Proclamation of January 1863 alarmed much of the white working class in New York, who feared that freed slaves would migrate to the city and add further competition to the labor market. There had already been tensions between black and white workers since the 1850s, particularly at the docks, with free blacks and immigrants competing for low-wage jobs in the city. In March 1863, white longshoremen refused to work with black laborers and rioted, attacking 200 black men. There were reports of rioting in Buffalo, New York, and certain other cities, but the first drawing of draft numbers—on July 11, 1863—occurred peaceably in Manhattan. The second drawing was held on Monday, July 13, 1863, ten days after the Union victory at Gettysburg. At 10 a.m., a furious crowd of around 500, led by the volunteer firemen of Engine Company 33 (known as the "Black Joke"), attacked the assistant Ninth District provost marshal's office, at Third Avenue and 47th Street, where the draft was taking place. Since the New York State Militia had been sent to assist Union troops at Gettysburg, the local New York Metropolitan Police Department was the only force on hand to try to suppress the riots. Police Superintendent John Kennedy arrived at the site on Monday to check on the situation. Although not in uniform, people in the mob recognized him and attacked him. Kennedy was left nearly unconscious, his face bruised and cut, his eye injured, his lips swollen, and his hand cut with a knife. He had been beaten to a mass of bruises and blood all over his body. Police drew their clubs and revolvers and charged the crowd but were overpowered. The police were badly outnumbered and unable to quell the riots, but they kept the rioting out of Lower Manhattan below Union Square. Immigrants and others in the "Bloody Sixth" Ward, around the South Street Seaport and Five Points areas, refrained from involvement in the rioting. The Bull's Head hotel on 44th Street, which refused to provide alcohol to the mob, was burned. The mayor's residence on Fifth Avenue, the Eighth and Fifth District police stations, and other buildings were attacked and set on fire. Other targets included the office of the New York Times. The mob was turned back at the Times office by staff manning Gatling guns, including Times founder Henry Jarvis Raymond. Fire engine companies responded, but some firefighters were sympathetic to the rioters because they had also been drafted on Saturday. Later in the afternoon, authorities shot and killed a man as a crowd attacked the armory at Second Avenue and 21st Street. The mob broke all the windows with paving stones ripped from the street. The mob beat, tortured and/or killed numerous black people, including one man who was attacked by a crowd of 400 with clubs and paving stones, then lynched, hanged from a tree and set alight. 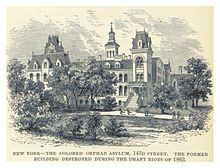 The Colored Orphan Asylum at 43rd Street and Fifth Avenue, a "symbol of white charity to blacks and of black upward mobility" that provided shelter for 233 children, was attacked by a mob at around 4 p.m. A mob of several thousand, including many women and children, looted the building of its food and supplies. However, the police were able to secure the orphanage for enough time to allow the orphans to escape before the building burned down. Throughout the areas of rioting, mobs attacked and killed at least 120 black people and destroyed their known homes and businesses, such as James McCune Smith's pharmacy at 93 West Broadway, believed to be the first owned by a black man in the United States. Heavy rain fell on Monday night, helping to abate the fires and sending rioters home, but the crowds returned the next day. 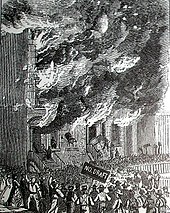 Rioters burned down the home of Abby Gibbons, a prison reformer and the daughter of abolitionist Isaac Hopper. They also attacked white "amalgamationists", such as Ann Derrickson and Ann Martin, two white women who were married to black men, and Mary Burke, a white prostitute who catered to black men. Governor Horatio Seymour arrived on Tuesday and spoke at City Hall, where he attempted to assuage the crowd by proclaiming that the Conscription Act was unconstitutional. General John E. Wool, commander of the Eastern District, brought approximately 800 soldiers and Marines in from forts in New York Harbor, West Point, and the Brooklyn Navy Yard. He ordered the militias to return to New York. Order began to be restored on Thursday. The New York State Militia and some federal troops were returned to New York, including the 152nd New York Volunteers, the 26th Michigan Volunteers, the 27th Indiana Volunteers and the 7th Regiment New York State Militia from Frederick, Maryland, after a forced march. In addition, the governor sent in the 74th and 65th regiments of the New York State Militia, which had not been in federal service, and a section of the 20th Independent Battery, New York Volunteer Artillery from Fort Schuyler in Throggs Neck. The New York State Militia units were the first to arrive. By July 16, there were several thousand Federal troops in the city. A final confrontation occurred on Thursday evening near Gramercy Park. According to Adrian Cook, twelve people died on the last day of the riots in skirmishes between rioters, the police, and the Army, including one African American, two soldiers, a bystander, and two women. The New York Times reported on Thursday that Plug Uglies and Blood Tubs gang members from Baltimore, as well as "Scuykill Rangers [sic] and other rowdies of Philadelphia", had come to New York during the unrest to participate in the riots alongside the Dead Rabbits and "Mackerelvillers". The Times editorialized that "the scoundrels cannot afford to miss this golden opportunity of indulging their brutal natures, and at the same time serving their colleagues the Copperheads and secesh [secessionist] sympathizers." The exact death toll during the New York draft riots is unknown, but according to historian James M. McPherson, 119 or 120 people were killed; most of them were black. Violence by longshoremen against black men was especially fierce in the docks area. In all, eleven black men were hanged over five days. Among the murdered blacks was the seven-year-old nephew of Bermudian First Sergeant Robert John Simmons of the 54th Massachusetts Infantry Regiment, whose account of fighting in South Carolina, written on the approach to Fort Wagner July 18, 1863, was to be published in the New York Tribune on December 23, 1863 (Simmons having died in August of wounds received in the attack on Fort Wagner). The most reliable estimates indicate at least 2,000 people were injured. Herbert Asbury, the author of the 1928 book Gangs of New York, upon which the 2002 film was based, puts the figure much higher, at 2,000 killed and 8,000 wounded, a number that some dispute. Total property damage was about $1–5 million ($20.3 million – $102 million, adjusted for inflation). The city treasury later indemnified one-quarter of the amount. Historian Samuel Eliot Morison wrote that the riots were "equivalent to a Confederate victory". Fifty buildings, including two Protestant churches and the Colored Orphan Asylum, were burned to the ground. 4,000 federal troops had to be pulled out of the Gettysburg Campaign to suppress the riots, troops that could have aided in pursuing the battered Army of Northern Virginia as it retreated out of Union territory. During the riots, landlords, fearing that the mob would destroy their buildings, drove black residents from their homes. As a result of the violence against them, hundreds of black people left New York, including physician James McCune Smith and his family, moving to Williamsburg, Brooklyn or New Jersey. The white elite in New York organized to provide relief to black riot victims, helping them find new work and homes. The Union League Club and the Committee of Merchants for the Relief of Colored People provided nearly $40,000 to 2,500 victims of the riots. By 1865 the black population in the city had dropped to under 10,000, the lowest since 1820. The white working-class riots had changed the demographics of the city, and white residents exerted their control in the workplace; they became "unequivocally divided" from the black population. While the rioting mainly involved the white working class, middle and upper-class New Yorkers had split sentiments on the draft and use of federal power or martial law to enforce it. Many wealthy Democratic businessmen sought to have the draft declared unconstitutional. Tammany Democrats did not seek to have the draft declared unconstitutional, but they helped pay the commutation fees for those who were drafted. Secretary of War Edwin M. Stanton authorized five regiments from Gettysburg, mostly federalized state militia and volunteer units from the Army of the Potomac, to reinforce the New York City Police Department. By the end of the riots, there were more than 4,000 soldiers garrisoned in the troubled area. The short-lived 1968 Broadway musical Maggie Flynn was set in the Tobin Orphanage for black children (modeled on the Colored Orphan Asylum). ^ "VNY: Draft Riots Aftermath". Vny.cuny.edu. Retrieved August 1, 2017. ^ a b Eric Foner (1988). Reconstruction: America's Unfinished Revolution, 1863–1877, The New American Nation series, pp. 32–33, New York: Harper & Row; ISBN 0-06-093716-5 (updated ed. 2014, ISBN 978-0062354518). ^ "Wolfram-Alpha: Computational Knowledge Engine". Wolframalpha.com. Retrieved August 1, 2017. ^ "Prologue: Selected Articles". Archives.org. August 15, 1990. Retrieved August 1, 2017. ^ "The Draft in the Civil War", u-s-history.com; accessed August 28, 2015. ^ a b "Maj. Gen. John E. Wool Official Reports for the New York Draft Riots". Shotgun's Home of the American Civil War blogsite. Retrieved August 16, 2007. ^ a b c d e f g h i j k l m Harris, Leslie M. (2003). In the Shadow of Slavery: African Americans in New York City, 1626–1863. University of Chicago Press. pp. 279–88. ISBN 0226317757. ^ "King Cotton Cotton Trade", New York Divided: Slavery and the Civil War, New-York Historical Society; accessed May 12, 2012. ^ a b Roberts, Sam (December 26, 2010). "New York Doesn't Care to Remember the Civil War". The New York Times. Retrieved April 26, 2014. ^ New York Divided: Slavery and the Civil War Online Exhibit, New York Historical Society (November 17, 2006 to September 3, 2007, physical exhibit); accessed May 10, 2012. ^ "On This Day", New York Times; accessed March 17, 2016. ^ McPherson, James M. (2001). Ordeal by Fire: The Civil War and Reconstruction. McGraw-Hill Education. p. 399. ISBN 0077430352. ^ Pete Hamill (December 15, 2002). "TRAMPLING CITY'S HISTORY 'Gangs' misses point of Five Points". New York Daily News. ^ "Patrolman Edward Dippel". Odmp.org. Retrieved August 1, 2017. ^ "Maj. Gen. Charles W. Sandford Official Report (OR) For The New York Draft Riots". Civilwarhome.com. Retrieved August 1, 2017. ^ a b "Maj. Gen. John Z. Wool Official Report (OR) For The New York Draft Riots". Civilwarhome.com. Retrieved August 1, 2017. ^ John Ellis Wool biography, bio19c.com; accessed April 26, 2014. ^ "US Military casualties in the 1863 Draft riots..." Civilwartalk.com. Retrieved August 1, 2017. ^ Swinton, William (August 1, 1870). "History of the Seventh Regiment, National Guard, State of New York, During the War of the Rebellion: With a Preliminary Chapter on the Origin and Early History of the Regiment, a Summary of Its History Since the War, and a Roll of Honor, Comprising Brief Sketches of the Services Rendered by Members of the Regiment in the Army and Navy of the United States". Fields, Osgood & Company. Retrieved August 1, 2017 – via Google Books. ^ "Edward Jardine". localhistory.morrisville.edu. Retrieved August 1, 2017. ^ "13th New York Cavalry – Battles and Casualties during the Civil War – NY Military Museum and Veterans Research Center". dmna.ny.gov. Retrieved August 1, 2017. 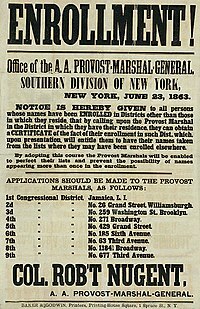 ^ "1863 New York City Draft Riots", mrlincolnandnewyork.org; accessed April 26, 2014. ^ "17th NY Veteran Regiment of Infantry – battles and casualties during the Civil War – NY Military Museum and Veterans Research Center". dmna.ny.gov. Retrieved August 1, 2017. Bernstein, Iver (1990). The New York City Draft Riots: Their Significance for American Society and Politics in the Age of the Civil War. New York: Oxford University Press. ISBN 0198021712. Cook, Adrian (1974). The Armies of the Streets: The New York City Draft Riots of 1863. University Press of Kentucky. ISBN 9780813112985. Rumsey, David. "Map Of New York and Vicinity (1863)" (1863 ed.). Matthew Dripps. Retrieved July 20, 2007. Schecter, Barnet (2005). The Devil's Own Work: The Civil War Draft Riots and the Fight to Reconstruct America. Bloomsbury Publishing. ISBN 080271837X.